It’s unusual for such a heavily researched and annotated work as this to be so exciting. The author chose the stories of women with a lot to tell, and she makes the reader care. The author also categorizes stories that defy category. Not surprisingly, the stories begin with the trek west. The reader learns about Margaret Reed, a member and survivor of the ill-fated Donner party. The ordeal is real without being overly graphic. Amelia Stewart Knight was another early settler who faced unbelievable hardship – along the Oregon Trail. 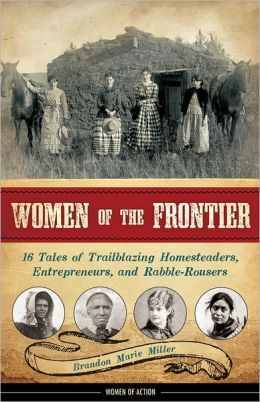 The next three women – Narcissa Whitman, Miriam Davis Colt, and Frances Grummond – faced unusual challenges establishing households on the frontier. Narcissa set out to be a missionary to Native Americans in Oregon. She was killed without converting a single “heathen.” Miriam wrote a book about her failed colony in Kansas. Frances married an army office and found new meanings for isolation and deprivation. Many women in the West learned to make their own way. Luzena Stanley Wilson went west with the Gold Rush and made a living feeding or housing the men. Clara Brown was a laundress/entrepreneur/philanthropist. Bethenia Owens-Adair was a healer and physician. Not everyone spent all their time with mere survival. Martha Dartt Maxwell became a taxidermist and introduced western animals to the East. Charlotte “Lotta” Crabtree was a baby-faced, famous singer. Many women considered the future of the West. Mary Elizabeth Lease immersed herself in the populist movement. Carry Nation fought for temperance and women’s suffrage. In the category of culture clash, Rachel Parker Plummer and Cynthia Ann Parker are examples of white women held captive by Native Americans. Sarah Winnemucca and Susette La Flesche were Native Americans who fought for their native people. This work is great as a referential beginning point for a fifth grade unit of the American West or Native Americans. Many of these women wrote about their lives, so reading activities naturally flow into learning more about them and the topics they wrote about. The author includes a table of contents, notes, resources, an index, and numerous photos.